Madison Park Apartments offers one and two bedroom apartments. Please select a unit that you like, fill out your name, number, and email, and you will be redirected to our quick and convenient online application. Not seeing what you're looking for? Availability changes every day, if you tell us what your needs are we’ll call you when availability changes. All room dimensions are approximate and may vary by apartment. 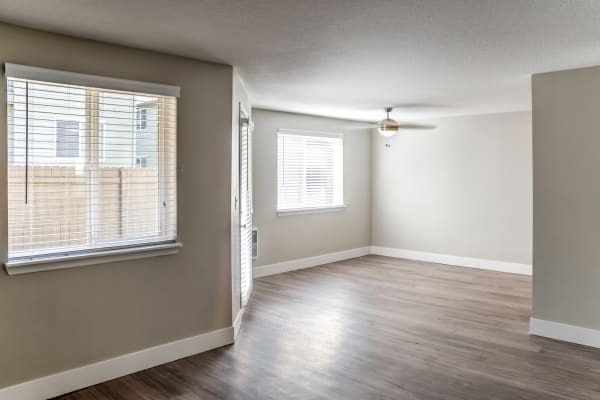 Whether you’re an employee at PeaceHealth Southwest Medical Center, a university student at Clark College, a growing family, or anyone in between, we have an ideal living space for you at Madison Park Apartments. Nestled on our quiet community sprinkled with old-growth trees and northwest pines, our two-story gated community is perfectly positioned in the charming Burton neighborhood. To complement our surroundings, our one and two bedroom apartments for rent in Vancouver, Washington, offer contemporary features, perfectly suited to your modern life. Each of our homes features a convenient in-home washer and dryer, so you never have to take long trips to the laundromat. Plus, many of our apartment homes offer upgraded kitchens, impeccably appointed with sleek stainless-steel appliances, custom cabinetry, deluxe countertops, and designer-inspired lighting. Offering one and two bedroom floor plans beginning at 747 sq. ft., Madison Park Apartments offers spacious apartments at affordable prices. After you prepare a meal in your well-equipped kitchen, enjoy it in your dedicated dining area. On a nice evening, you can eat your meals outdoors on your private balcony or patio. Each of our living spaces featuring attractive and easy-to-clean hardwood-style flooring and ample storage options, so you can organize your space just how you like it. If you’re ready to find your ideal apartment in Burton, Vancouver, WA, contact Madison Park Apartments today.